* epic.Tournaments - Nothing serious, no prizes, just honour, pride etc. Some of these fun tournaments won't even be on computers! * epic.Hunt - Follow the clues around the venue to pick up a prize. * epic.Achievements - Certain things that you do at the event will give achievements which will be added up at the end of the event. * Not to mention all of the usual things you would expect to find such as consoles, social/chill-out area, licensed bar, etc. To make it even easier for us to communicate with people at the LAN we have our custom made bigscreen that will be shown at both ends of the venue and you can view on your own machine as well. This system also scans the network for games so you know what is available to join. Have a look at epic.LAN :: Gallery for more pictures of our last event. Hope to see you there, remember you have until April 1st to take advantage of our early payment discount. So it's just mere weeks now until the epic.FOUR LAN Party, 65 people coming so far and with places going every day, we're looking forward to a great turnout for our summer LAN. And keep an eye on the website over the coming weeks for our full event timetable, details about our pub quiz, hunt and more! 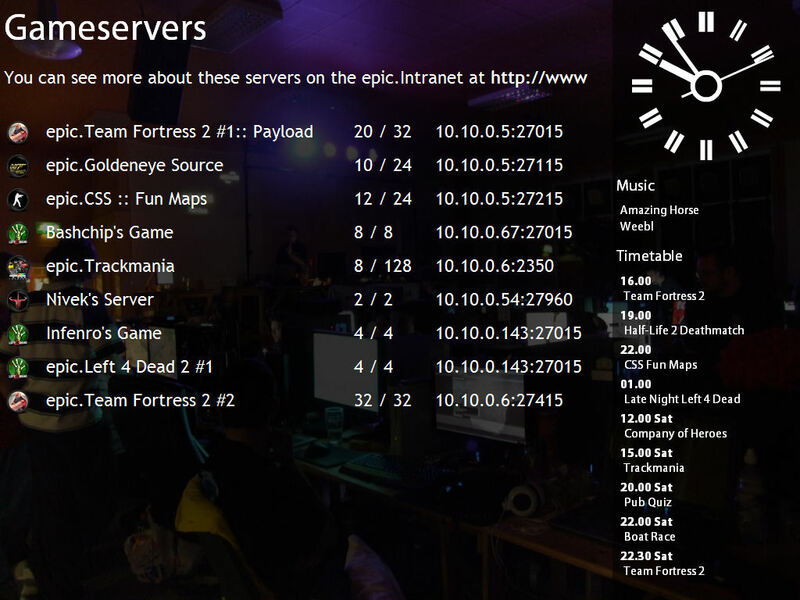 We've recently added some new features our the epic website including our new community profiles and game stats so you can track your progress in our weekly games nights as well as a return to some oldschool IRC stats for all of your #epic.lan chatting. If all that sounds tempting, then all you need to do is make your way to epiclan.co.uk/epic4 and hit the signup button. Simples!